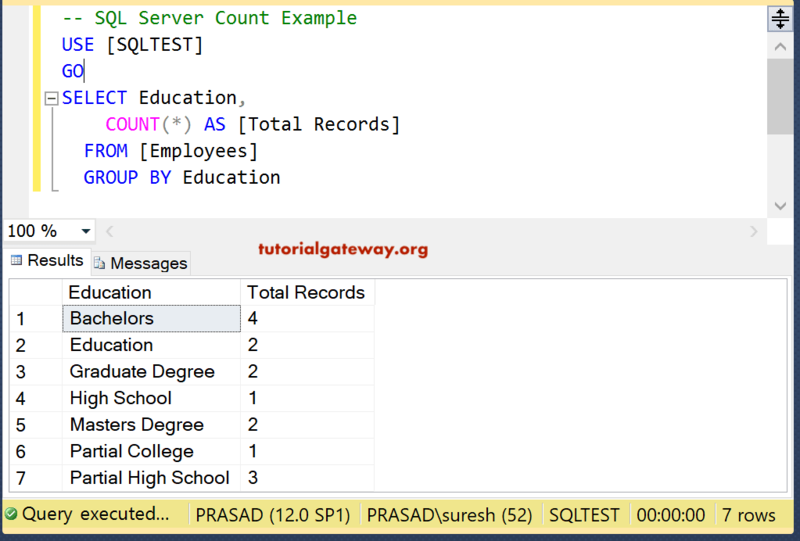 The SQL COUNT Function is one of the Aggregate Function which is used to Count the number of records (or rows) selected by the SELECT Statement. For example, If you want to find the total Number of products present in your Store or you want to find the Black colour products present in your Store. 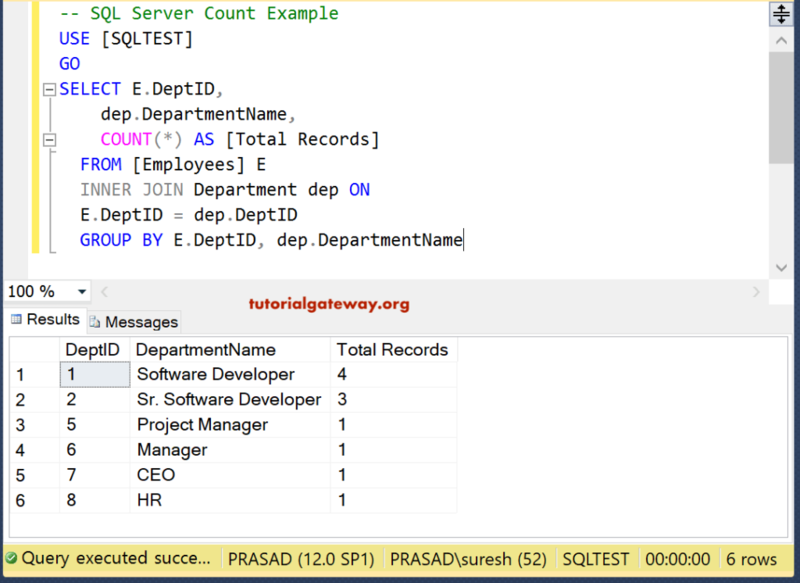 In these situations, you can simply use this SQL Server COUNT function. NOTE: The COUNT(*) counts NULL values and Duplicate records as well. NOTE: The COUNT(Column Name) counts the Duplicate records. 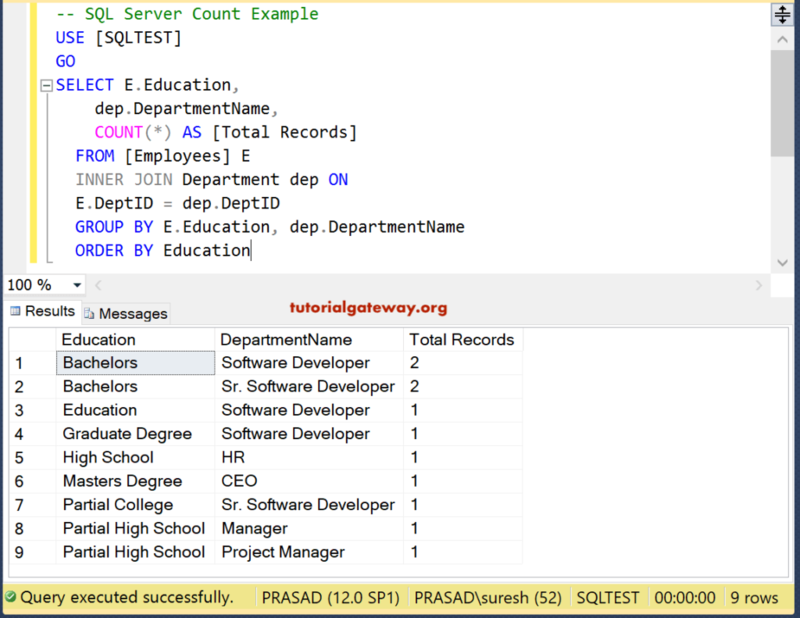 The Sql Server COUNT (DISTINCT Column_Name) simply returns the Unique number of records present in the table whose values are NOT NULL (Ignores the NULL Records). TIP: The DISTINCT Keyword is used to remove the Duplicates from the specified column Name. The COUNT(ALL Column_Name) is same as COUNT(Column_Name). The following example shows you the same. 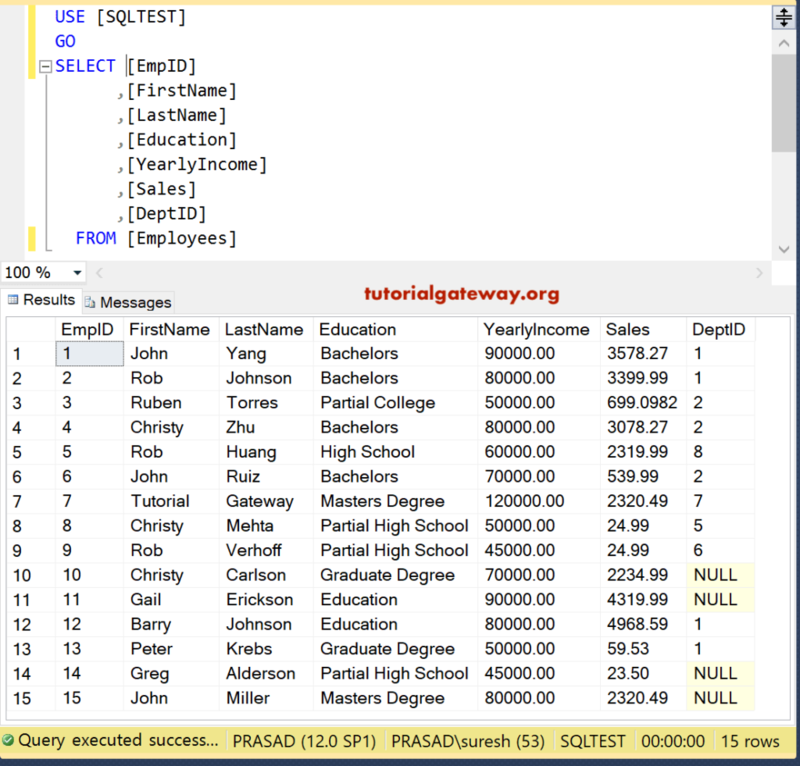 Above SQL Query will find the total number of Employees belongs to each education group. This is another example to showcase the Group By clause along with the Count Function. In this example, we are using Count, Count Distinct functions on multiple columns along with the group by. If you want to check the conditions against the aggregated data then you have to use HAVING Clause along with Group By Statement. For example, the following query will group the Customers by their Education and counts the records present in each group. Below lines of code will check whether the total count of Employee Ids is greater than 1 or not. If this is True then corresponding records will be displayed. 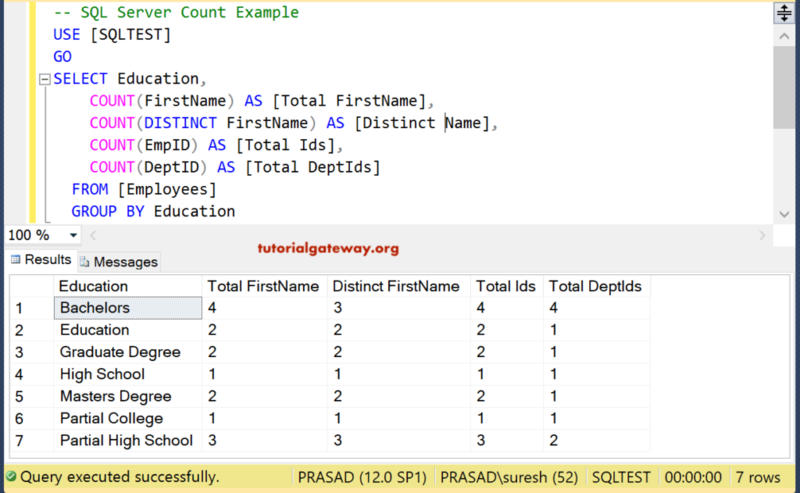 You can use the SQL Server Count function in the Order By Clause. Below query count the records group by the Education. Next, Order By clause will sort those query result based on the Distinct Count of first name result in descending order. 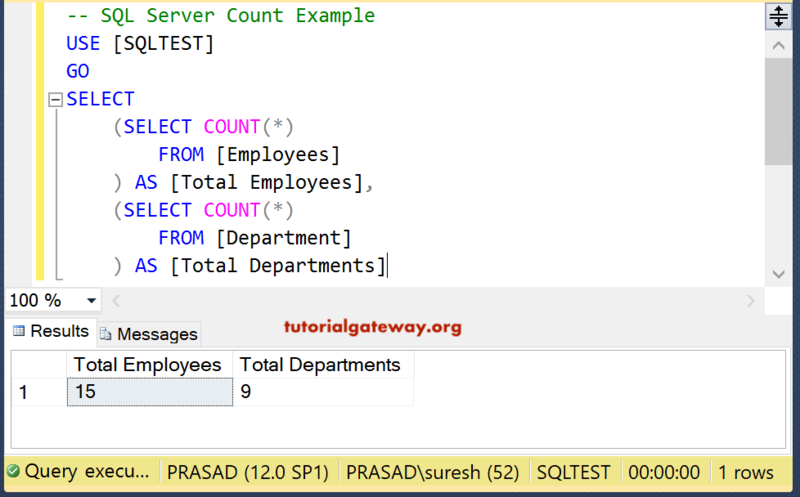 You can use SQL Count function along with the Joins. In this example, we are using Inner Join to join Employee and Departement table. Next, we are counting the total records grouped by Department name. 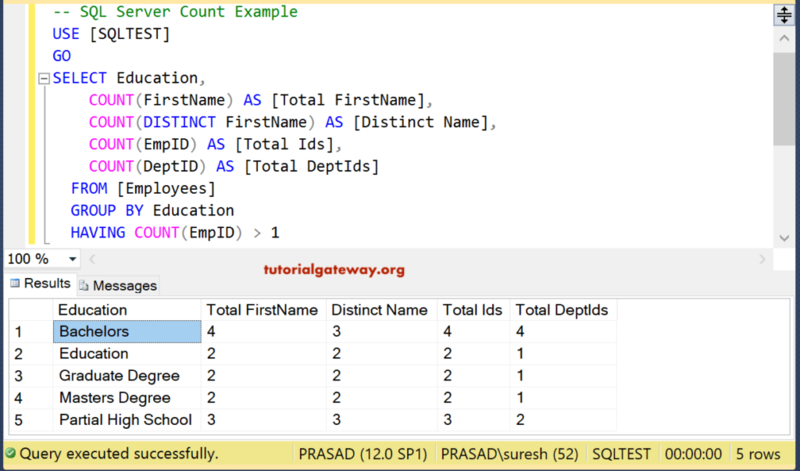 This is another example to demonstrate the Joins along with Sql Server count function. 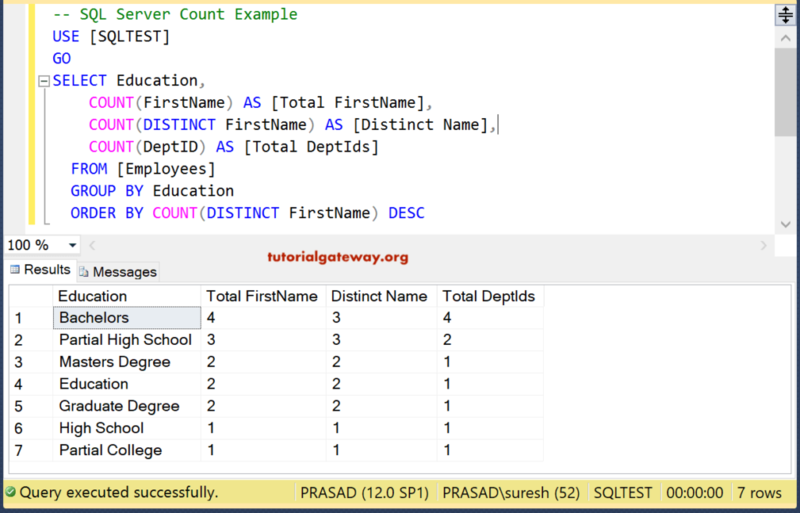 You can use Sql Server Count function on Multiple Tables. Below query will count all the records from Employee table, and Department table.